Despite my initial excitement, it took me until early 2014 before I got around to play BioShock Infinite. It did not disappoint. I’ve been a big fan of the BioShock franchise ever since Rapture, Andrew Ryan and Atlas first blew my mind in 2007. I am even one of the BioShock 2 apologists (we have t-shirts), which I thought did a respectable job of following up a title it could never hope to exceed in the minds and hearts of gamers. When it was announced that Irrational Games and series director Ken Levine would return to the franchise with BioShock Infinite, I couldn’t be more excited. The sky city of Columbia didn’t have the same immediate appeal as the sunken city of Rapture, but it still looked and sounded awesome. That E3 reveal was a wonder to behold. Despite my initial excitement, it took me until early 2014 before I got around to play BioShock Infinite. It did not disappoint. At its core, it’s still a BioShock first-person shooter. You run from point A to point B while shooting at stuff and occasionally using a -plasmid- vigor or two. It was a lot of fun for sure, but it wasn’t anything we hadn’t seen or played before. The story, though – and the setting! The ending of BioShock Infinite blew my mind. 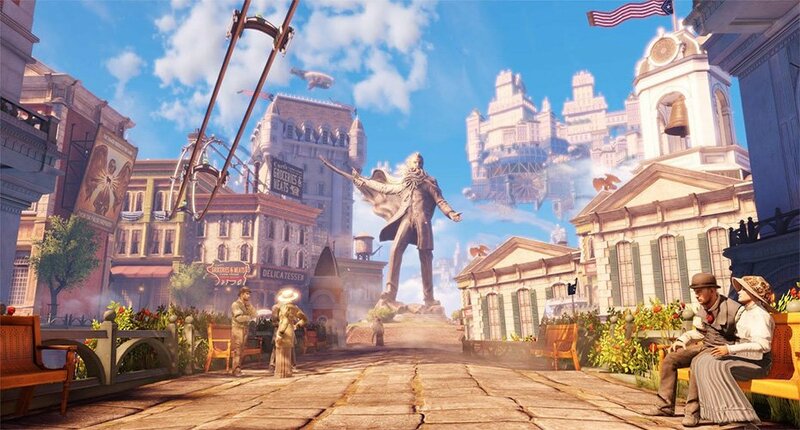 As in the first BioShock, the real main character of BioShock Infinite isn’t the player character or the antagonist, but the city. Every aspect of Columbia is incredibly well realized. The visual design of the city and it’s inhabitants is stunning, of course, but the game’s depiction of race segregation, class warfare and religious abuse is just as impressive. As in previous BioShock games, these ideological aspects of BioShock Infinite are explored more in-depth in the audio logs and film projectors scattered around the world. And then there’s the ending. The ending of BioShock Infinite – well, really the entire final hour of the game – blew my mind. The way the game wraps everything up was a beauty to behold, both the first, second and third time I played through it. Gameplay-wise, BioShock Infinite is a small improvement over it’s predecessors. But the storytelling sets a new standard for the genre.